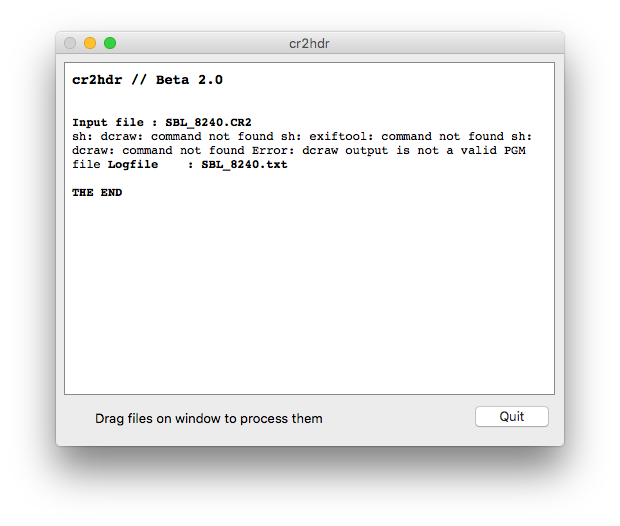 I installed both dcraw and exiftool using the installer included in the OSX_cr2hdr.zip . Looks like you are using a very old and no longer supported GUI wrapper for cr2hdr. Try using the actual command line version, MLP, or the lightroom plugin. These are still being supported. is there anything else out there similar as easy as drag and drop? or is the lightroom plugin or switch thing the only way to convert now? I could probably implement dualiso drag and drop straigh to Switch if it´s useful. Will work multiprocessing style(4 processes in parallell).